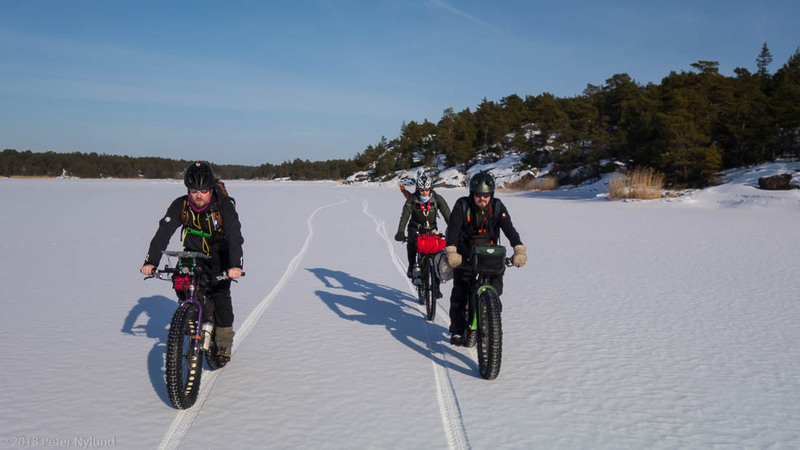 At the end of February it happened: The cold weather and weak winds combined with the lack of snowfall got the southwestern archipelago covered with ice. I did nice skating trips, like this one, and also decided to investigate if one of the many trip ideas I have in my mind would be possible. I started to look at ice charts and satellite images on a Monday and noticed that there indeed was an ice cover all the way from Turku to Åland. 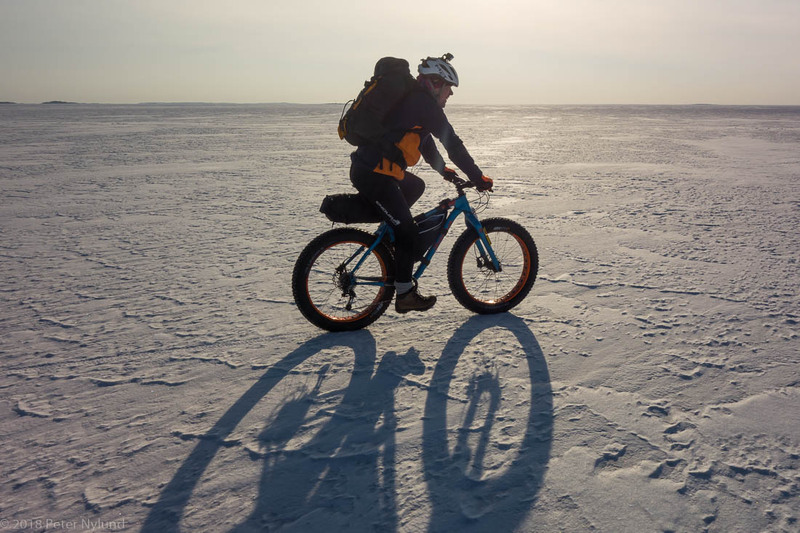 I thought I would give the ice a week to grow thickness before going out there, since I have no interest in being far out on weak ice with a fatbike, and started to check for possible trip mates. No one could come in the beginning of the next week, but we got a small gang together the weekend after. I settled for this, since the weather forecast looked good, and started planning for a nice relaxed trip starting from Åland with a first night at Långnäs after having arrived there with the night ferry. 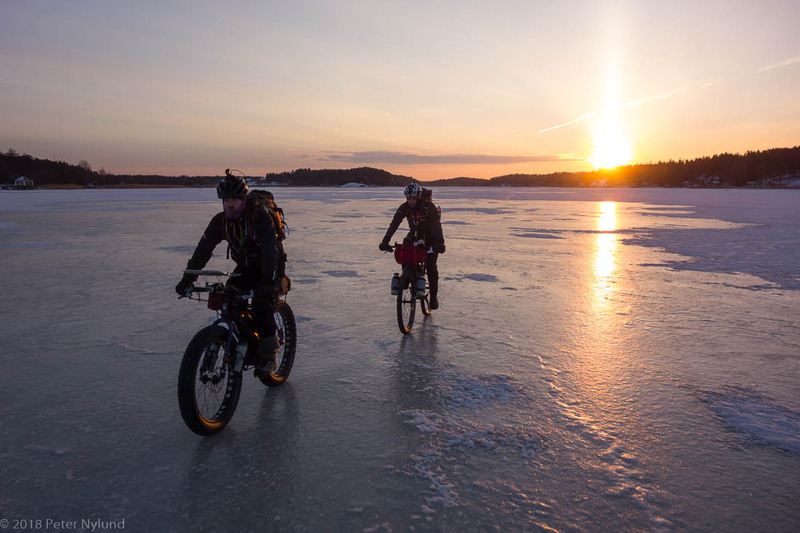 A nice day of riding followed by a night on a nice island and finally arriving back to Turku sometime the day after that. It would have been an extention of a trip I actually had done once before in more difficult conditions. The Monday before the trip the forecasted weather changed rather abruptly. Snow was forecasted for Thursday, which would make the trip impossible, since you need to be able to see the ice reasonably well to be able to assess it. 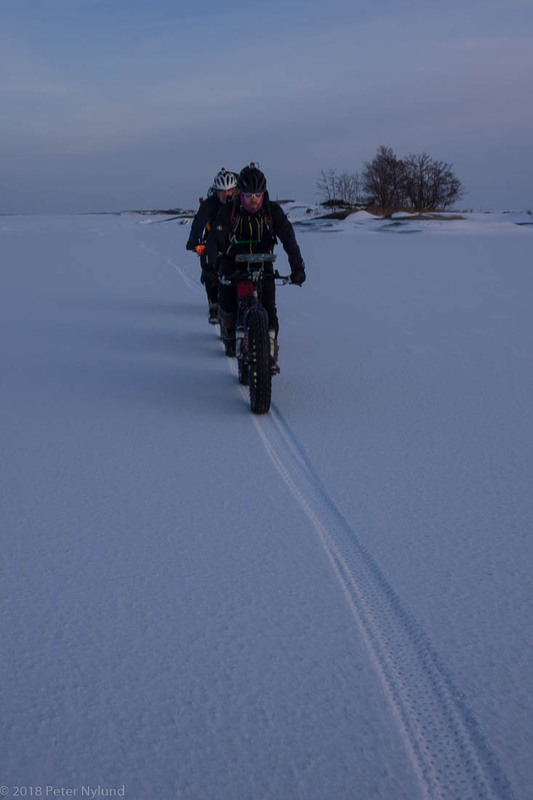 Wednesday was the last day possible and due to the time frame I came up with another approach: Starting from Turku and going fast and light to Långnäs on Åland in one long day. 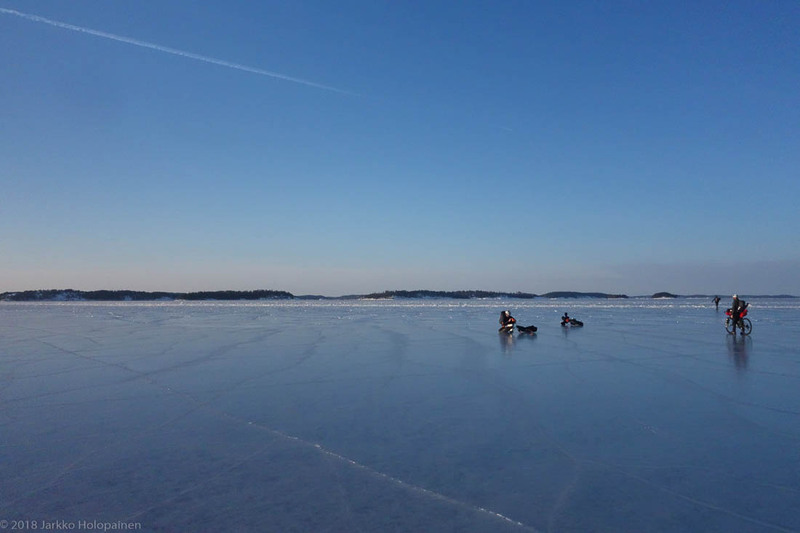 The weather still looked good and the ice had grown stronger and stronger, though a little snowfall on Monday closer to Åland had me a little worried. 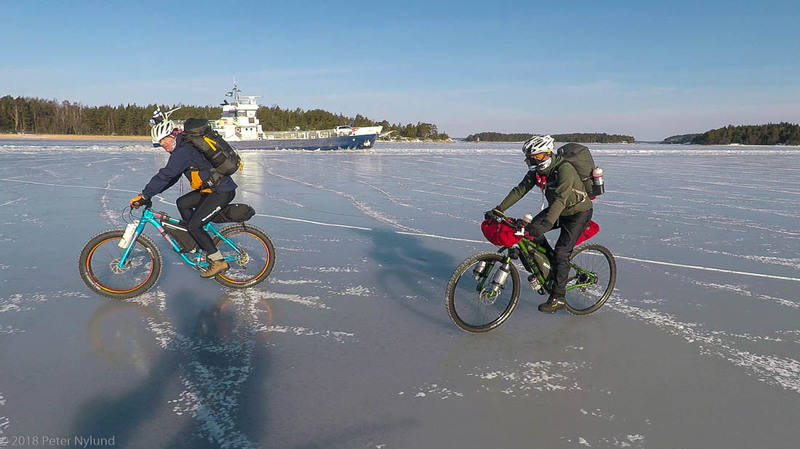 I called out on the MTB-Turku Facebook group for comrades, knowing that there was only a very small chance I could accept someone I didn't know into a demanding trip like this one. The different trip format, however, yielded result and I got four companions that I knew well and trusted, people I have done outdoor stuff with for almost ten years. The trip was a go! 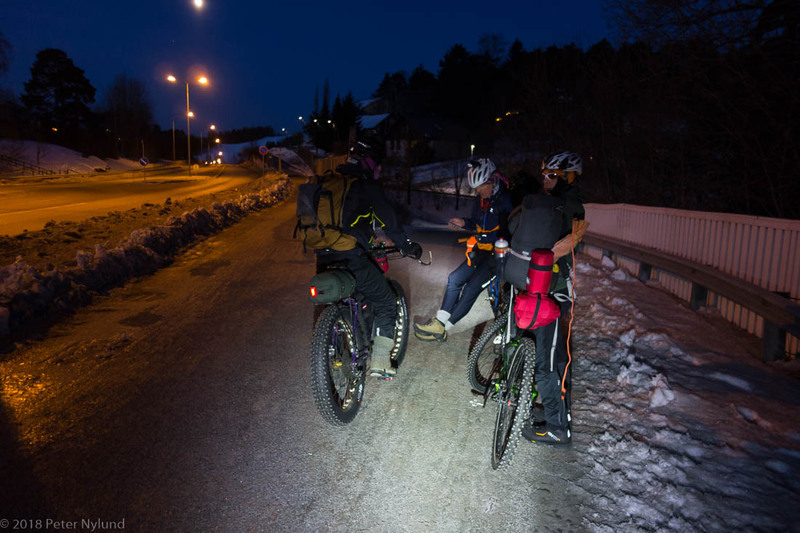 On Wednesday morning we met up at 06:00 in the morning close to my place and started riding towards the Hirvensalo bridge, where we would meet up with our fifth member, JJ. 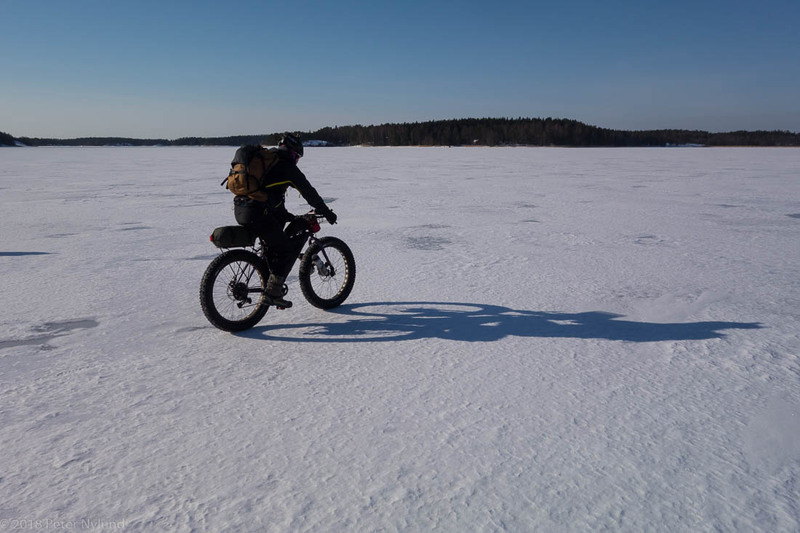 He was a bit late, and it was a bit cold waiting with riding clothing in a temperature a little below -10°C, but a little before seven we entered the ice at Pitkäsalmi. ... and the slick hard ice of Airisto began. This section had the weakest ice of the entire trip. I had been skating there a few days earlier and had encountered several places were the ice pole went through fairly easily. 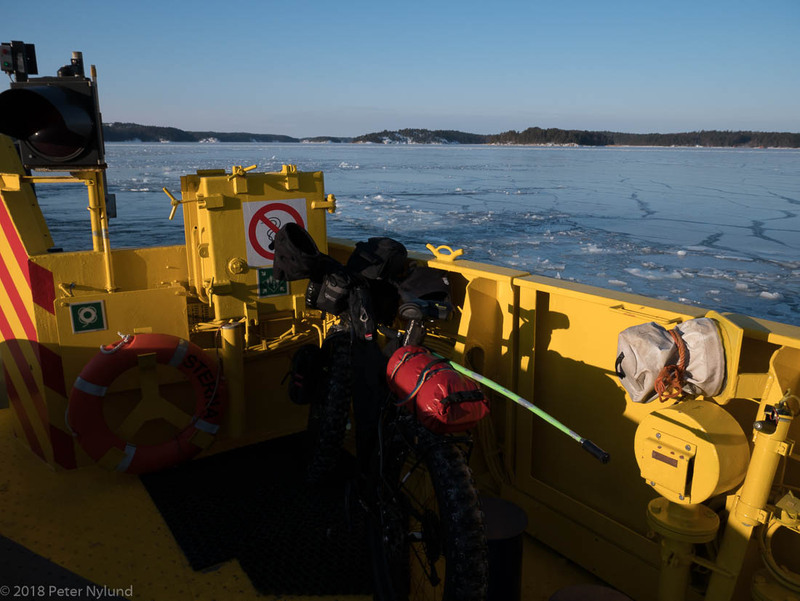 I went to check out the ice lane that was between us and Nagu, but deemed a crossing unnecessarily risky, especially when we had the opportunity to take a ferry with a fairly short detour. 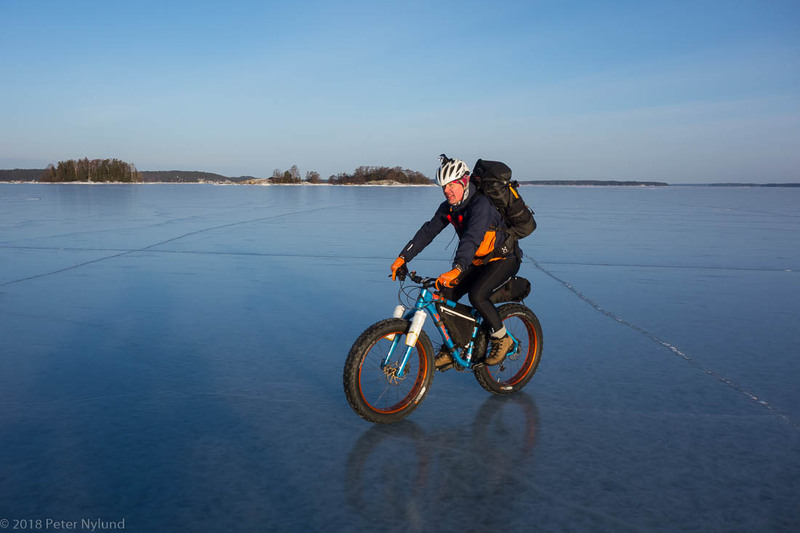 With skates this one wouldn't have been too difficult, but bikes are not skates. We continued to Lillmälö and took the ferry over to the Nagu side. 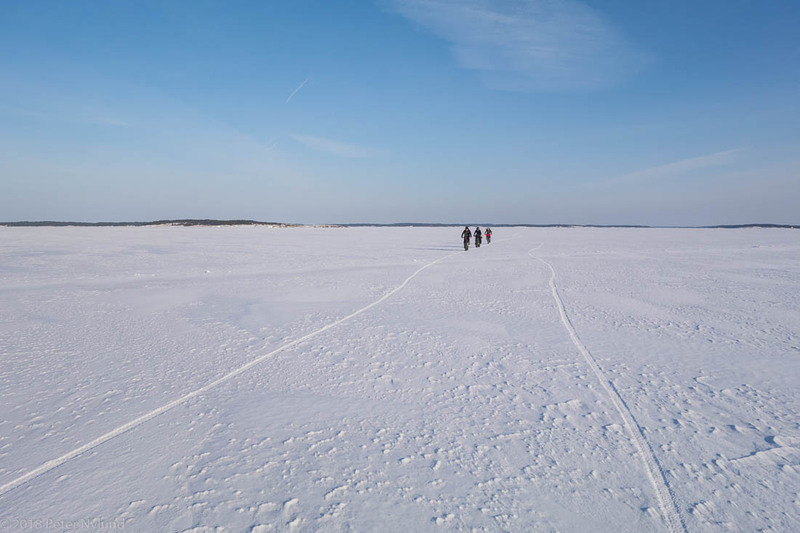 We continued on the north side of Nagu on excellent ice in tail wind. Everything went very well. That is until we came upon the first ice lane that was too weak to cross. I had information that these ferries no longer were running, but was obviously wrong. I chose to go to Själö/Seili to get passed this obstacle, which turned out to be the wrong choice and we soon turned back. About a half hour was lost to this. 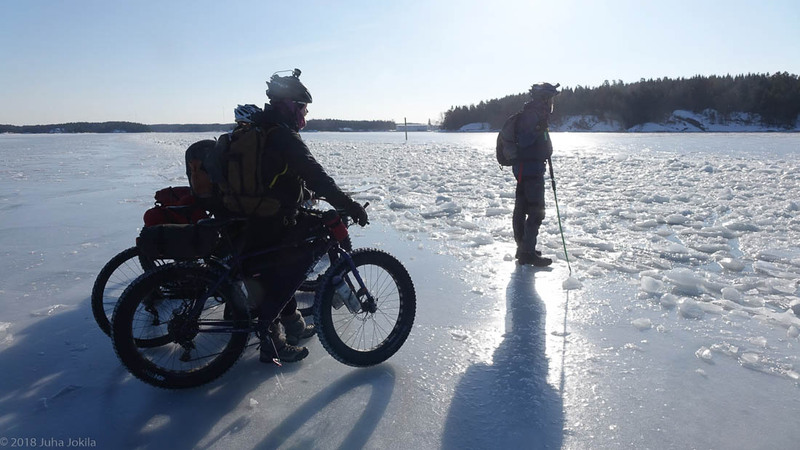 We followed the ice lane back towards Nagu city only to find out that it took us a good bit back towards east. 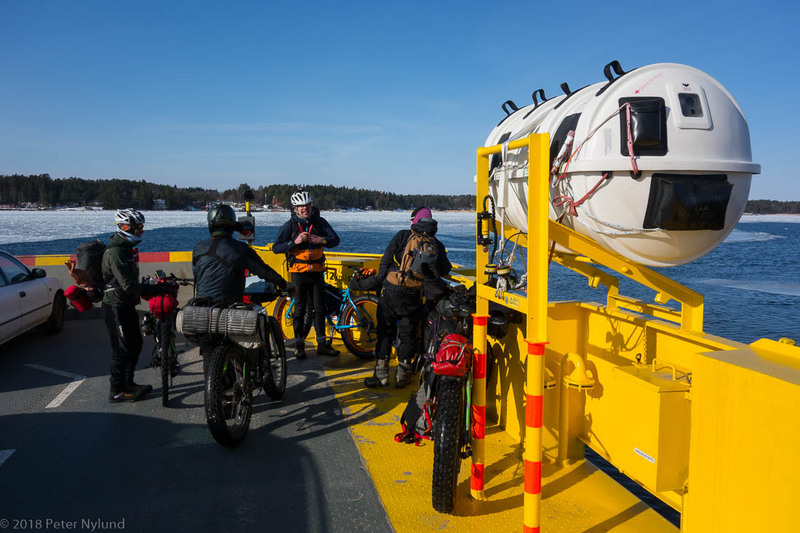 ... and when we got to the road we had already passed Nagu with a good bit and rode directly towards the ferry to Korpo. 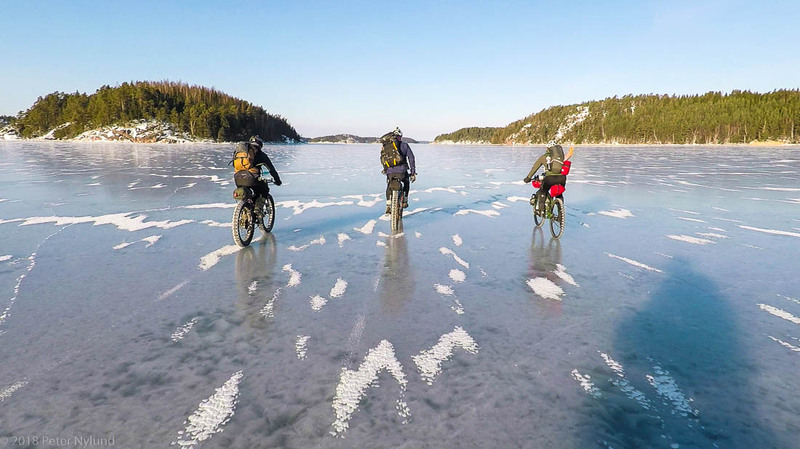 We thus missed part of the ice north of Nagu. The good thing that we now had time for a good lunch at Hjalmar's Restaurant and Pub before the ferry to Houtskär. 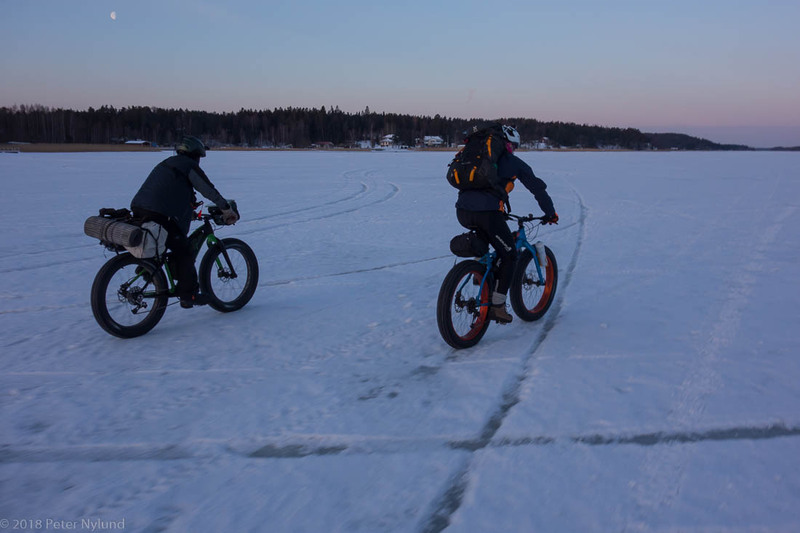 These last two ferries were absolutely necessary, since both cross very big ice lanes that are not passable with fatbikes. In the best of circumstances a skater could get over by carefully crawling over, but not at this particular place. 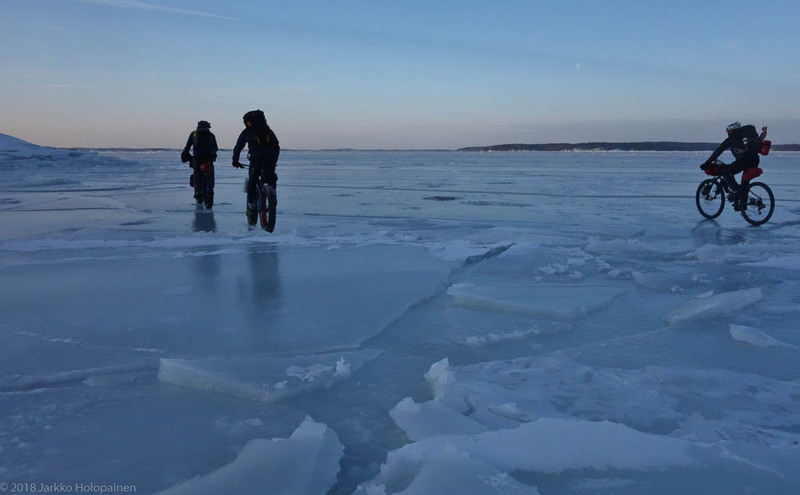 After the Houtskär ferry the biggest ice section began, around 70 km to Lumparland of Åland. 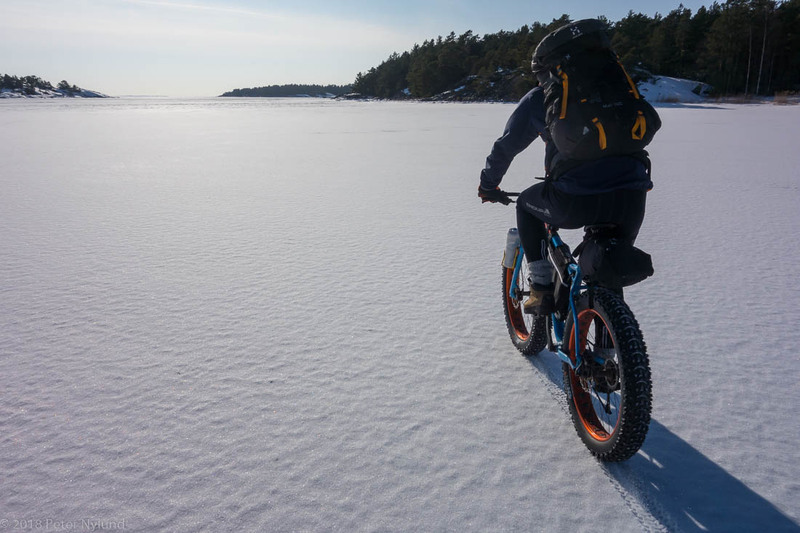 The first leg would be to cross Skiftet/Kihti to Kumlinge, around 40 km. It was now quite warm when riding with the tail wind. 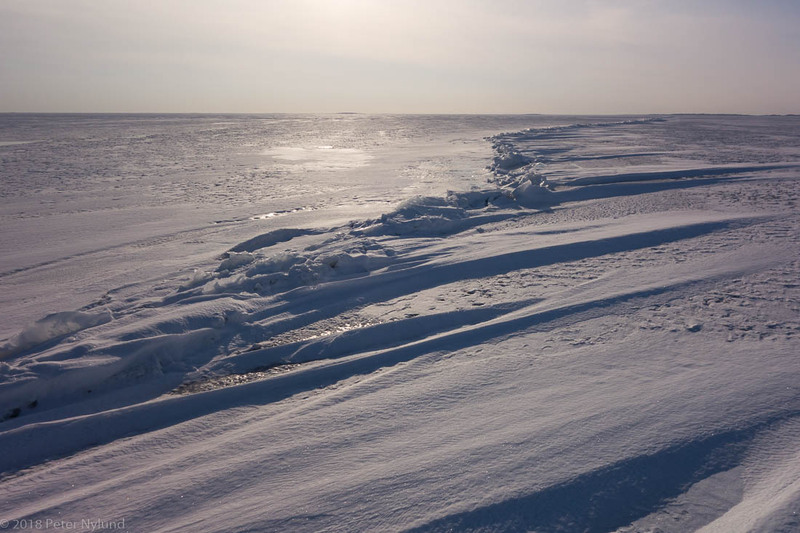 Though the goal was to keep away from weak ice, we were prepared to handle a situation where the ice would break, since sea ice is a dynamic medium that seldom is 100 percent safe. We all had ice prods around our necks, everyone had spare clothes packed in waterproof bags and all but one had a backpack to aid floatation in water. Two of us also had throw lines, as can be seen on me to the left in the next picture. Breaking through ice would thus have been unpleasant, but no emergency. What was less nice was the snow on the ice, which had fallen on Monday. The amount was small enough not to hinder assessment of the ice too much, but it was very tighly packed and slowed us down a lot. Matti at the middle of Skiftet/Kihti. The ice was so thick that it was utterly pointless to use the ice pole, but JJ, who had less experience with ice insisted I try. 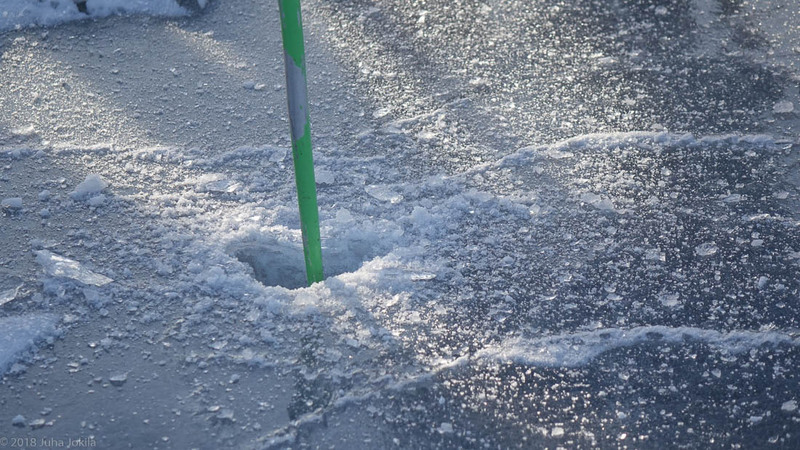 I got through 15 cm of the very hard ice before giving up: There clearly was more that 20 cm of ice under us. Arriving at Kumlinge at bit before sunset. 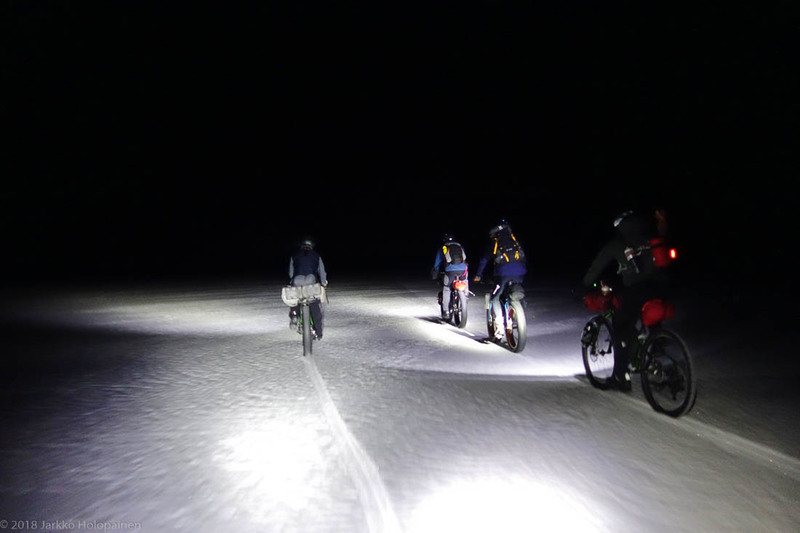 We now decided to use the bailout card, since we had agreed prior to the trip not to ride on ice in the darkness. 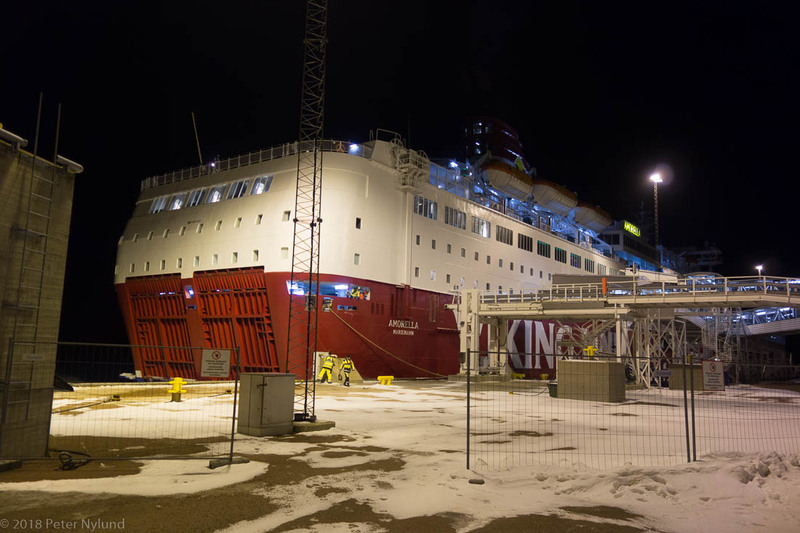 We would wait for the ferry to Vårdö at Kumlinge, where a heated waiting cabin was available. Also, we definitely were in need of a little rest and food at this point. After having waited for over three hours, suspicion started to arise. A bit after the scheduled ETA of the ferry I made a call and was informed that the ferry currently was on another route. Looking at the web site I later found that information, but it wasn't directly visible. This presented us with a little problem. The following possible ferry would be the next morning and would be late enough that the slightest delay or problem would prevent us from reaching the ferry back to Turku the day, meaning we wouldn't be home before Friday morning. The booked return trip early Thursday morning would of course have been impossible. 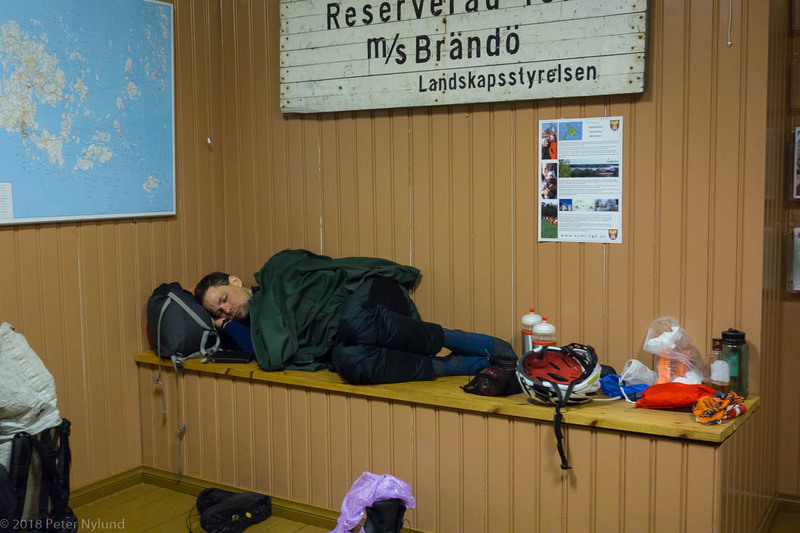 It would have been no problem to sleep in the waiting cabin, though it is not meant for that. After a brief discussion we found ourselves continuing a little after half past nine in the evening. 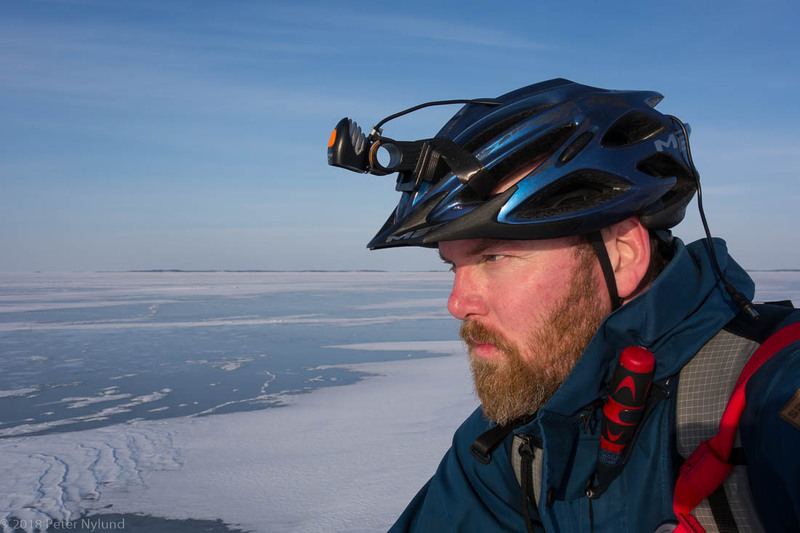 There was still the possibility to abort and return to the cabin if the ice would seem sketchy in the beginning. Continuing at this point was a school book example about both what not to do and what to do: Most accidents happen when a time schedule pushes you to continue beyond tiredness and what is reasonable. On the other hand, we were now rested and had eaten. I was also very sure about the ice, having studied the topography and followed ice reports from the area for over a week. 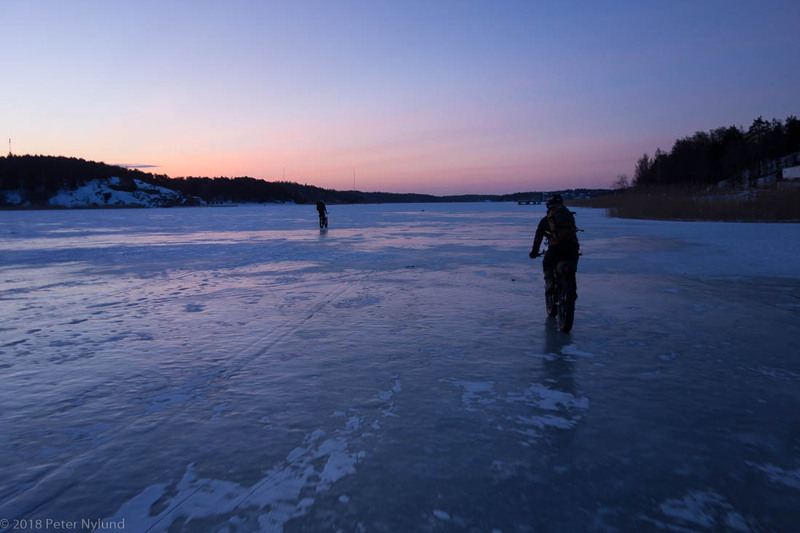 As long as we would keep our distance to Långnäs, which has unsafe ice due to the boat traffic, the ice was expected to be fine. We started with 5 km on road on Kumlinge, before entering the ice. 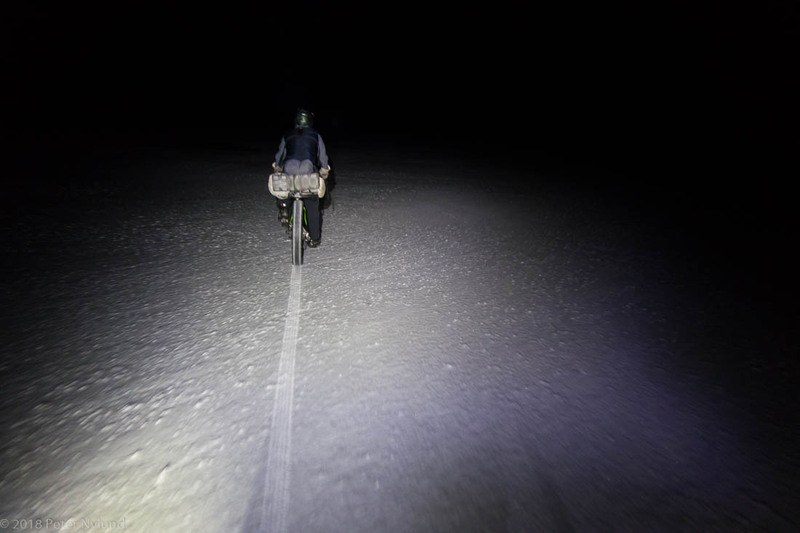 There was snow also on this section, a 30 km crossing of Delet/Teili. It greatly affected our speed and robbed us of energy. Going through the ice at this point could have become an emergency, since we were now quite tired. 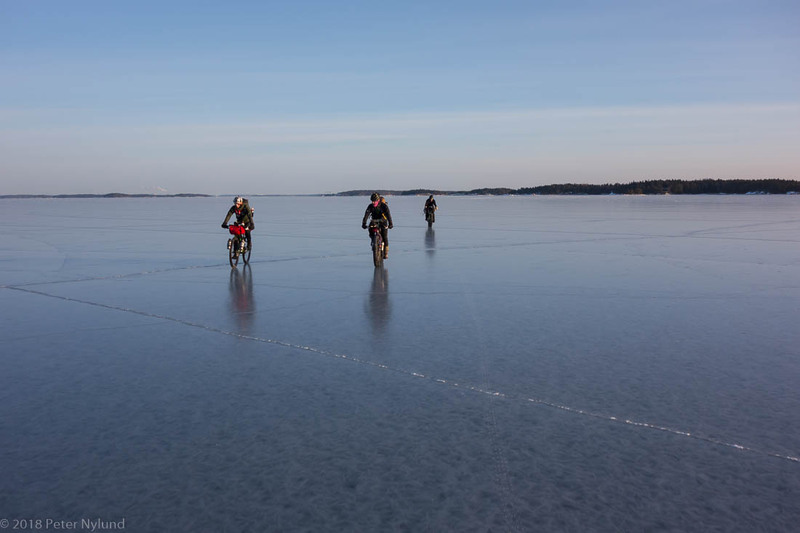 I tried to assess the ice as we rode on, but found nothing suspicious. The ice made some sound when being close to islands, but that is normal. 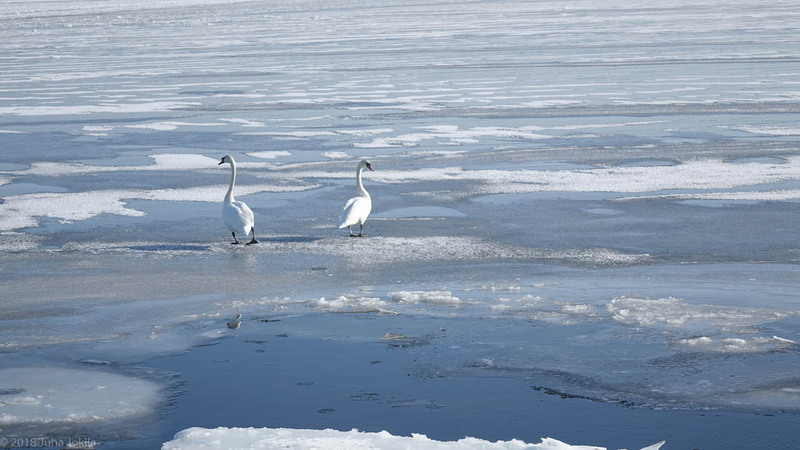 It was only a for a short moment I heard an unfamiliar ice sound close to a small skerry, but couldn't figure out another reason for it than ice settling. When nearing Långnäs the ice started to consist of ice floes frozen together, a sure sign that something affects the ice greatly. This was not the time to take further risks, so we immediately went to the shore and took a detour on roads to Långnäs. This last section of 10 km on roads was very tough. 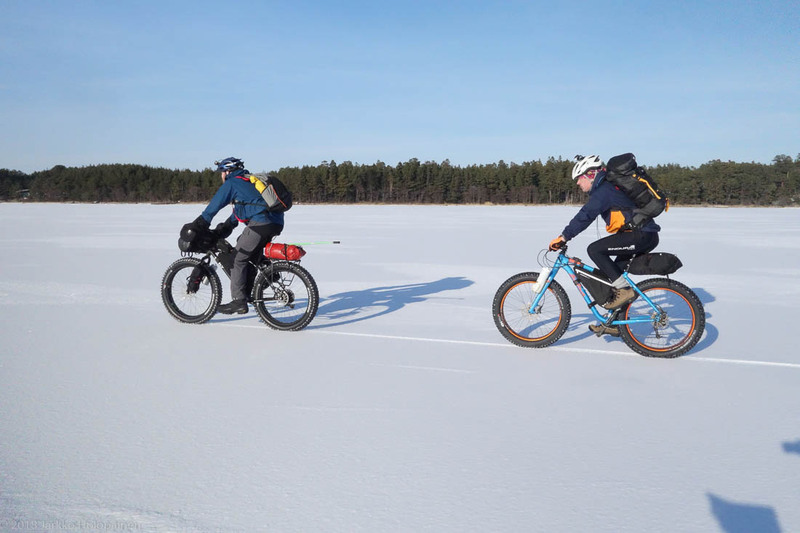 The entire section from Kumlinge to Långnäs took almost four hours, with 30 km on ice and 15 km on road. With a little under two hours until the ferry home would arrive we had time to eat a little and change to dry clothes. Slowly our energy started to return and we started to appreciate the trip, which in my opinion definitely qualifies as an epic one. 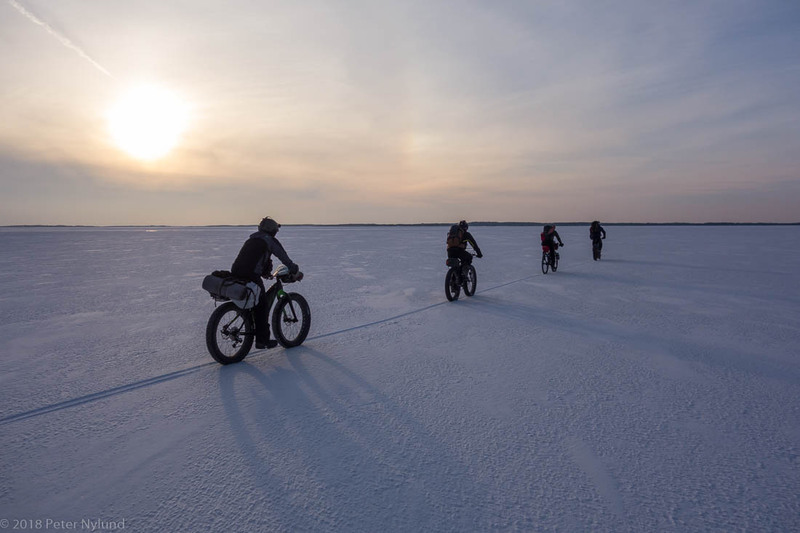 The distance we rode was 180 km of which almost 130 km on ice. It is also a trip that is not possible to repeat very often. The previous opportunity was 2011 and the one before that 2003, all due to the ice, or rather lack thereof. A big thanks to the trip comrades. This is the kind of trip few can be trusted with. I also thank JJ and Jarkko for some pictures, since mine were a bit lacking. Jarkko's blog report in Finnish is here. Here is a very rough map of the area. I'm not publishing the GPS track, in accordance with the policy of the Tour Skater's association in Finland. There have been a lot of discussion of that and the consensus is that exact locations and ice observations are kept out of the general public due to safety reasons.